In my many years of experience, two things in sports are for certain. There’s no crying in baseball, as attested to by the great manager, Jimmy Dugan. And there’s no such thing as rally scoring in pickleball. I’ve looked throughout the whole IFP (USAPA endorsed) Rule book, and rally scoring is mentioned NOWHERE. Yes that’s right. Not once is rally scoring mentioned anywhere in the long standing rules of pickleball. 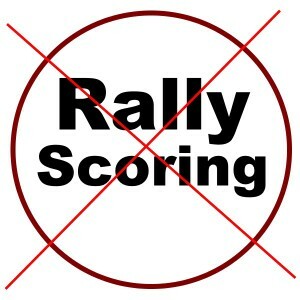 Yet we hear, or sometimes even witness, people justifying the use of rally scoring in order to speed up the game. If we are going to change rules to speed up games, let’s get rid of the kitchen line. Everyone kamikaze to the net and duck so you don’t get hurt. That will speed up the game instantly. We could also eliminate that silly double bounce rule. That would allow everyone to go into attack mode right way and thus speed up the game. That could work. Heck, while we’re at it, let’s let people serve overhand instead of underhand. Think of the speed and spin you could put on the ball. That would definitely speed up the game. Pretty soon we can have a game to 11 played in about 2 minutes if we don’t dilly dally much while chasing the ball. What are people thinking?!?!?!? As you can probably tell. I get a little miffed when people decide on their own to change rules. It probably doesn’t seem like a big deal at the time. “Hey we’ve got people waiting to play so we need to move the games along.” Seems so innocent to simply award someone a point after every rally. But that’s not what the inventors of the game wanted. The challenge with arbitrarily changing a rule is that every new person who is introduced to a seemingly innocent tweak of the rules then teaches that to other new players who carry it (sounds like an infectious disease) back to their home courts and pretty soon you have a rogue rule raging out of control (ok, now it sounds like a wildfire, but you get the picture, it’s all bad for the sport) that makes it hard to get rid of when you get enough courts and everyone has plenty of court time. If you have ever had the pleasure of sitting down and talking with some of the “old guard”, you know that the pickleball rules were written in such a way to, above all else, always maintain a balance between offense and defense. That is why there is a double bounce rule. That is why you can only serve underhand. That is why we have that pain-in-the-neck kitchen line. And that is why you only get to score a point when you are serving. To do otherwise, changes the way the game is played, the strategy you would use, and the integrity and intent of the game. If we need to reduce court wait times, simply shorten the games to 9 or 7 or even 5. Everyone learns the game as it was intended and everyone gets to play. But pleeeeeeeeeeease let’s don’t change the rules. I hope if you are an ambassador or champion of this wonderful sport that you are doing your best to help maintain the integrity of the game. Changing the rules to seemingly benefit a location or community certainly does not do that. It only tends to teach a game that is not pickleball. The leaders and USAPA board members have worked hard to maintain the original intent of the founding fathers from 50 years ago. And because they have done so, the game is growing at an astronomical pace. Yes, we don’t have enough courts, so let’s work hard to earn and get more. That will speed up and reduce the wait times. That is what we all need to work on. We have some interesting years ahead. Can’t wait to help, and can’t wait to watch it grow! Congratulations to all the players in Fishers, Indiana on the opening of your 6 new pickleball courts. This was another great example of what happens when a few players and their town and parks departments work together for the benefit of the community. Larry and Teresa Amick are enthusiastic local pickleball players living in the Del Webb community of Britton Falls in Fishers, Indiana. I still remember over a year ago, Larry and Teresa attended a small local tournament (120 players from 7 states) that we held in our tiny town of Brookville, Indiana. They came only to watch, and to take pictures and videos so they would have ammunition to use when they were ready to approach their local park about the possibility of getting some pickleball courts built for their community. They asked a lot of question while in Brookville and we gave them every answer we could and then some. Well, in July of this year, Larry and Teresa’s dreams along with those of many pickleball players in the Indianapolis area, came true. With Fishers Mayor, Scott Fadness and Parks and Recreation Director, Tony Elliot and Project Manager, Matthew Walker all on hand, 6 new courts were opened to the delight of all those in attendance. Area USAPA Pickleball Ambassadors, Paul Barksdale (Terre Haute), Melissa Muha (Indianapolis), and Rocket Grubbs (Brookville) were all on hand to give a pat on the back to all those who worked so hard to make this happen. After a ceremonial first match with the Mayor, the courts were opened for play and flooded with players.